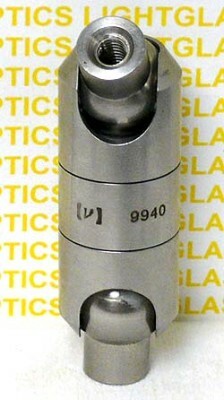 The New Focus 9940M Flex-Lock Post is threaded M6 on one end and M4 on the other. This way, it can be mounted on any metric breadboard, optical table or mount and the other end used to mount any load up to 100 inch-pounds. Due to its double ball joint design, this can be moved and swiveled into most any position and locked into place with a single screw. New Focus maintains that this can be used to hold a camera, IR viewer, or simple microscope, right on your optical bench.